Cash Flow – the wrong way! CASH FLOW – in the reverse direction from what we need – has been a recent problem with these Votive Candle donation boxes being broken open and the offerings of the Faithful stolen. If you are light-fingered (or funding drugs), and reading this (unlikely) – be warned. Our wide-ranging CCTV cameras zoom in for close-ups to help our local Police identify perpetrators. Thanks to them this thief is now in prison. 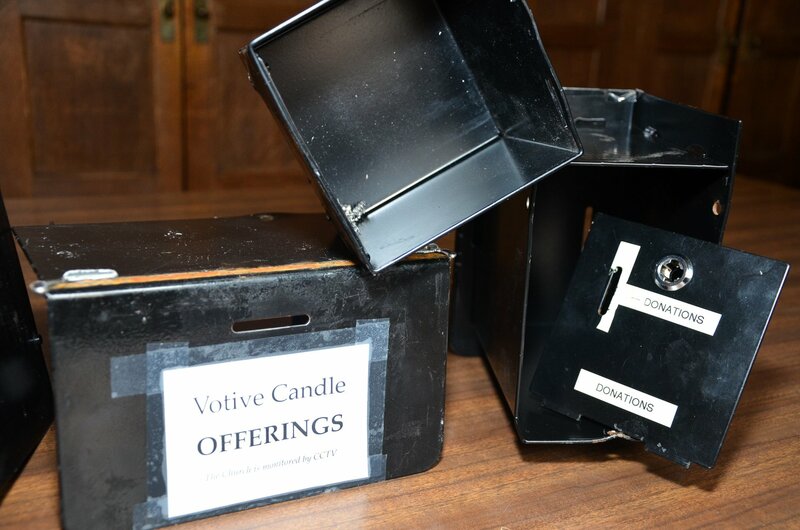 Temporary signs direct votive candle donations to the more secure wall safes, until long-term arrangements are made. We’re also exploring a cash-free card machine for electronic donations.